So you’re familiarizing yourself with deck-building concepts, and you’ve started to commit specific Dominion techniques to memory. But how do you know the best cards to choose? 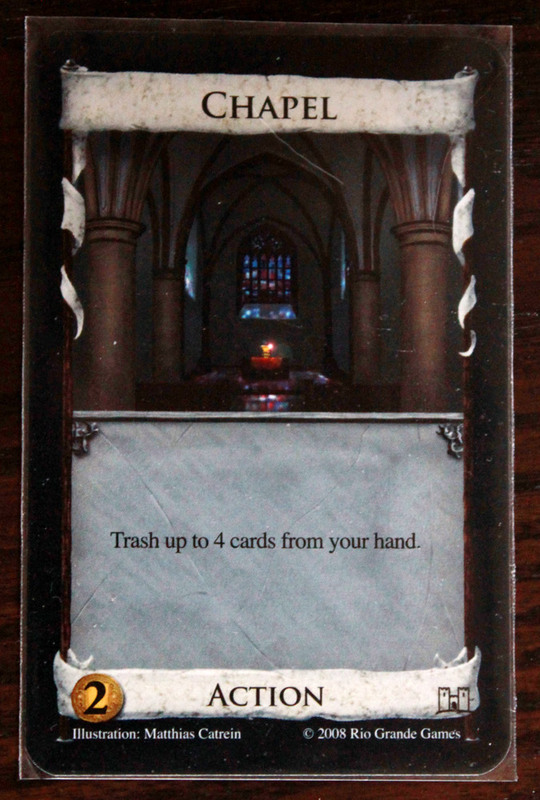 It helps to understand the various elements that appear on Dominion cards. You know, the +1 Cards, the +1 Buys, etc. etc. You may know the mechanics, but do you really understand what they mean? Any card that gives you more cards is nice, but don’t get too excited. Always keep in mind that the first card you draw is the card you would have had if the card you just played wasn’t in your deck in the first place. So a card that only gives you +2 Cards is really only affecting your hand by a single card increase. Which is why Moat isn’t that great. In addition, if you don’t get at least one action in addition to the cards, you run the risk of drawing your other action cards without getting much else. Obviously, drawing more cards gives you a higher chance of drawing what you need, but you can’t overstock on these. The biggest +Card draws are dead cards (or terminal actionals: they give no additional actions), so having too many can fill up spaces in your hand. Cards that give you additional actions are great. You can play them without worrying about not being able to play the next Action card that comes along. 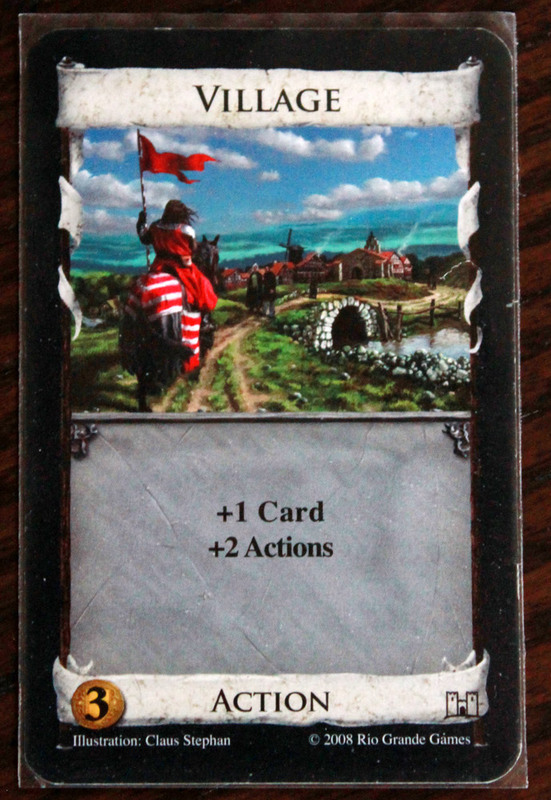 But Actions without action cards to use them on are useless, so don’t get too carried away buying Villages, especially early on. Ideally, you would have exactly the number of actions you need to play all your cards. 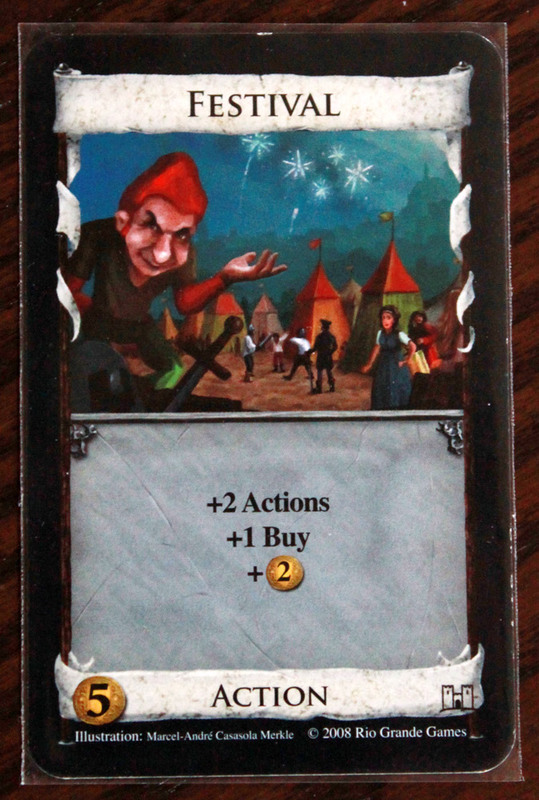 Although it doesn’t hurt to have plenty of extra actions, there’s really no point spending your buys on five Villages. +Actions are best supplemented with +Cards. Ahh, never underestimate the power of +Buys. Early on, they can help you get the cards you need, and later in the game, they can help you balance out victory card purchases with extra silvers (and sometimes even extra point cards). Buys are very valuable; but remember, they don’t do much for you without extra cash to back them up. Extra treasure on action cards is nice to have, but remember, you have to have an action to play them. If you’re not careful, you could end up having to choose between a useful (deck-refining, +cards, or attack) action or an action that gives you the treasure, instead of just having that useful action and a silver to spend afterward. If you buy an action with +(2) and never use its other ability, you should have bought a silver instead. Be especially careful with the ones that come with +Actions. That seems like they’re just as good as treasure cards, but if you play one of those dead +Cards actions and draw a +(2)/+2 Actions, you can’t play it. But you could have played a silver if you had drawn it at that point. 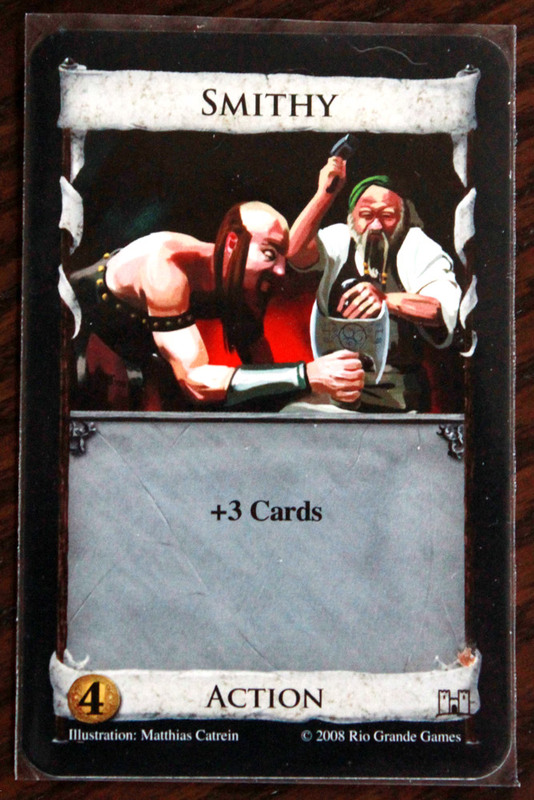 Many cards grant you the chance to add a card to your deck separate from the buy phase. This can be useful because it essentially gives you a second “buy” without using any of your treasure, although the price is usually limited. Once again, don’t get too excited about the free cards, though. 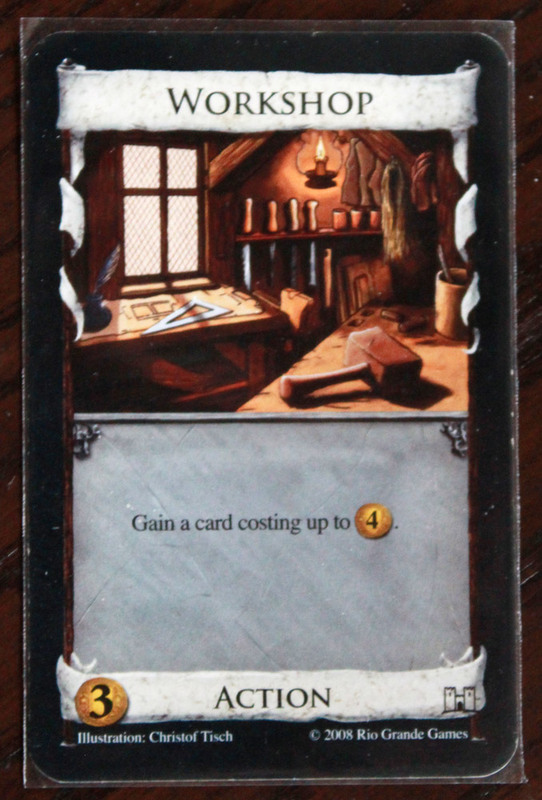 Often by the end of the game, you would much rather have a Gold or Silver in place of that Workshop because those three- to four-cost cards are just weighing down your deck at that point. However, often gain cards are paired with a “Trash” ability that allows you to replace one card with another, better card. 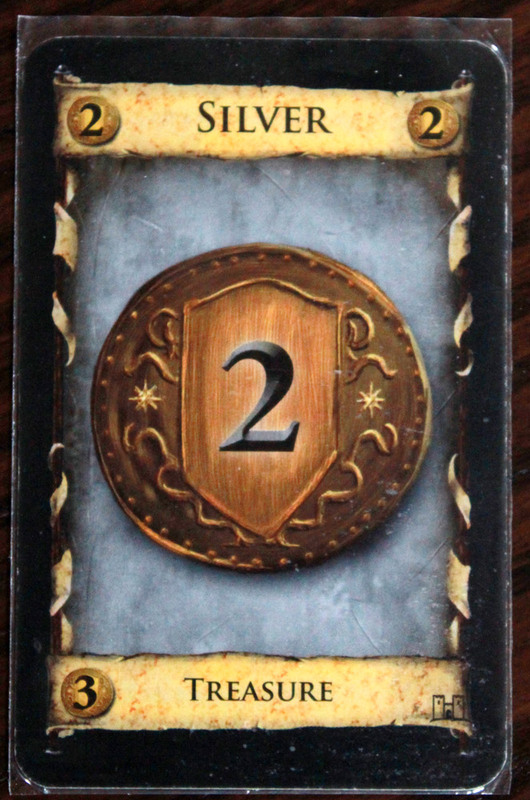 These cards often come in handy near the end of the game, because you can ditch the previously-useful-but-now-dead-weight action cards with another gold, or an extra point card. Who doesn’t love remodeling a gold into a province? Booyah! Okay, I think that about covers it for the basic keywords. Feeling more equipped? That’s great. Tune in next time for even more awesome explanations on what it all means when you put these things together, with visual aids! And what about all those complicated cards with revealing, discarding, and so forth? We’ll get to those, too. And attack cards. Are you excited? I am! Next Article FDQ: What Do You Play to Relax?